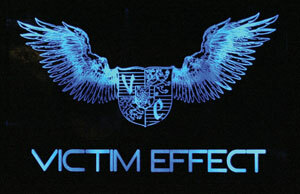 Victim Effect is a band based out of Provo, Utah that refuses to claim any particular genre of music, although on MySpace they are classified as “rock/electronica/metal”. They “got together” in September of 2004 and 20 days later they had their first “gig” at a wakeboarding competition. Since their “speedy beginning”, they haven’t slowed down, recording their first album, which was only five tracks long, sometime between September and November of 2004, hitting the road shortly after. www.victimeffect.com for $15, but you can get it at any concert they play at for $10. I guess it’s a sort of trade. You more than likely paid to go see them, so you pay less for the CD. They are on a U.S. national tour that started on campus May 1 this year. They have played in several states including Arizona, California, Idaho, Oregon, Michigan, and Nevada. On the Saturday, August 18, Victim Effect played at the Helper Arts Festival. They played almost all of their songs from their currently available album, but they snuck in a couple of songs that they are working on for the new album that they are writing, which surprised many, which could be heard from the cheering that, as far as the music carried, was carried as well. A week later, on August 25, they returned to campus for a Friday Night Schmoozers concert. Last Man Standing, a local band, preceded Victim Effect. This band was the winner for the 2007 Battle of the Bands. gave it to us with “The Tango”. Most of the band gathered together after the show to sign autographs, which many were more than happy to take advantage of. Brandon, the lead singer, says that it’s “always a blast” while performing. Dawn jokingly added, “while we kick each other in the shins”. They said that their fans are pretty laid back and don’t do anything “super crazy” to get their attention “outside of stalking” as Brandon lightheartedly put it. Dawn, the keyboardist, doesn’t sing very much. She sings one song pretty much by herself and one song with Brandon on the CD. She said that the reason she doesn’t sing very much is because she is “timid” and “like[s] hiding behind my[her] keyboards”. They said that their favorite sayings are anything from the movie Half Baked, although none of them smoke, they still love the movie. If Micah, one of the guitar players, wasn’t performing he said he “would be landscaping”. Dawn said she would be a “shell collector” and Brandon said he “hopes” he would be “a bum on the beach somewhere” *laughs. Some of the people that inspire them are Jimmy Eat World, 3rd Eye Blind, Muse, Freddy Mercury from Queen, Anthony Green from Saosin, and Tom York from Radiohead. maybe we will find out after their next concert on campus. Everyone wants to know where the band came up with the choreographed head banging, which is sort of their trademark. They said that it “started on accident” when they were taping and they just happened to be moving at the same time and they notice that it “looked sick” or that “the crowd responded” loudly. They just fine-tuned it from there and it was basically the whole band that decided to choreograph it. We don’t currently know when we will see them on campus again, but on September 8, King Gordy will be hitting the stage for another Friday Night Schmoozers concert, so if you find time, try to make it over there at 6 p.m.